Contamin-Eater Whole House Water Filters by Selecto are by far the best choice for protecting the Health of your family, appliances and your plumbing. Don't settle for only removing sediment and chlorine like most whole house water filtration systems! For your health, choose Contamin-Eater to also reduce toxic chemicals by 99%. If your water is disinfected with chloramine (chlorine plus ammonia) there is no better choice on the market than the unique Hollow Carbon media used in our Contamin-Eater! In addition to your health, protect your expensive appliances, water pipes, and stainless steel from the corrosive effects of chloramine. These whole house water filter systems are the same as commercial filters used in thousands of restaurants and by the world's largest beverage producers like Coca~Cola and Pepsi. For over 28 years Selecto has enjoyed the loyalty of commercial cusomters. Now they are available to the public too! Tested to ANSI/NSF Standards 42 & 53, these filters provide superior water purification. Unlike most, because of Selecto's patented Hollow Carbon technology, these filters reduce Chloramines as well as Chlorine. All Contamin-Eater Whole House Water Purification Systems reduce: Chlorine, Chloramine, Sediment, Bad tastes and odors, Cysts, Organics, Tannins, MTBE, chlorination by-products like THMs as well as other VOCs. We also offer Fluoride Reducing Systems. Easy and inexpensive to install, in fact many homeowners are able to install their own. No messing in used toxic media. 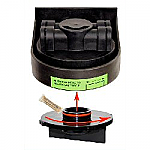 Sanitary Quick Change Cartridges mean you can replace cartridges in minutes and with NO TOOLS required! No electricity or backwashing required. Remember to choose the SMALLEST system that seems to meet your needs. If you need help deciding which filter is right for you, check out our "Choosing the Right Filter" page. Or call us @ 770-532-4743 or Verizon 678-936-1274 for assistance. * Our Sediment Pre-Filters are rarely needed with the Contamin-Eater, but if your water is very high in sediment they're a great choice! Often used with Well Water. Also Houston and Boston are very high sediment areas that benefit from the use of a pre-filter. 5 year Warranty by Selecto. ezClearWater.com 30 Day Money Back Satisfaction Guaranteed! * For Chlorine, this filter is large enough for 3-4 people for a full year. Our Best Seller Single Cartridge Water Filtration System! Our Hollow Carbon media far out performs carbon block, activated carbon, granular carbon. See Details for lots more information. * For Chlorine, this filter is large enough for 4-5 people for a full year. * For Chlorine, this filter is large enough for 6 or more people for a full year. * For Chloramine, filter Capacity: 42,000 gallons. * For Chlorine, this filter is large enough for group living (up to 10 people) for a full year.